The 10 Best Summer Activities in West Virginia! The Mountain State is full of great things to do in the summer. There are mountains to hike, rivers and lakes to swim and fish in, historic places to visit, caves to explore, trains to ride, and much, much more. Get outside and soak up the sun with these 10 great summer activities in West Virginia. 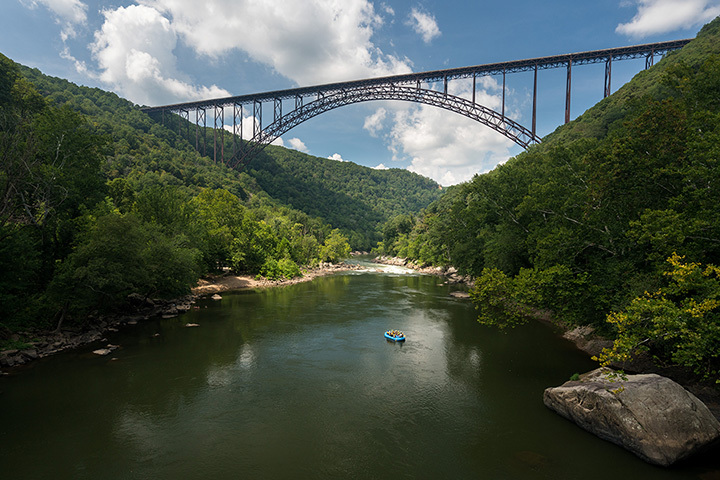 From the fearless to the fainthearted, you’ll find an activity you’ll love somewhere in the beautiful New River Gorge area of West Virginia. The New River Gorge Bridge is a modern miracle of transportation. This 3,000-foot bridge is a structural piece of art and a frequently photographed location. Opened for travel in 1977, there are many thing to do like camping, whitewater rafting, hiking and biking, climbing, fishing, base jumping, scenic drives, and special programs that tell you more about this awesome area of the Mountain State. You can even take a tour under the bridge, and don’t forget the annual Bridge Day celebration each October. Step back in time to when lumberjacks and their families lived in the small town of Cass, West Virginia, and worked hard to bring down the tall trees from the mountains, float them downriver to the mill, and off to manufacturing plants to be made into lumber. Cass Scenic Railroad State Park is located in one of the most beautiful areas of the state and visitors can hear about the history of the area from knowledgeable guides, then take a ride on one of the well-preserved steam-driven Shay locomotives up the mountain. There’s a replicated logging camp called Whittaker Station that shows what life was like for those working there in the early 1900s. Fun for the whole family is what you’ll find at Seneca Caverns in Riverton, West Virginia. Originally used for ceremonial purposes by the local Native Americans, visitors have been touring the caves since 1928 and delighting in the amazing rock formations found there. Tours last about an hour, and afterward, young and old alike can try their hand at mining for gemstones on the premises. It can be a little chilly down under, so make sure you have a sweater even in the summer months. If you enjoy history, you’ll want to visit Prickett’s Fort in Fairmount, West Virginia. A replica of the original fort built in 1774, every attempt has been made to depict what life was like for the settlers who lived there during times of unrest with the local natives. There are plenty of picnic areas nearby, and the Monongahela River provides a great place to fish or boat. Hikers, joggers, and cyclists will enjoy the numerous trails that surround the area, too. Conserving the wildlife and educating the public about the flora and fauna found in the Mountain State, the West Virginia State Wildlife Center in French Creek, West Virginia, has been recognized as a unique area and a major attraction that serves and protects, rather than destroys the natural wildlife. Many animals native to Appalachia make this protected place their home, including bison, elk, mountain lions, wolves, otters, boars, and many species of birds. Families will also enjoy having a picnic in the park and fishing is abundant in the area. There’s a small gift shop where little ones can take a souvenir home to remember their special day. What could be better than relaxing in a naturally heated water bath? That’s what you’ll find at Berkeley Springs State Park. The bathhouse was opened in 1930, but visitors came to the therapeutic mineral waters long before that, including George Washington, who was a frequent bather. There is an outdoor swimming pool open to the public and special events are held in the summer, like Art in the Park and music concerts. Another great location for the family, Wheeling Park in Wheeling, West Virginia, offers many things to keep you busy throughout the year. There are plenty of picnic areas and shelters available around the 400-acre park, and pedal boating, swimming, tennis, and miniature golf are a few of the other activities visitors can enjoy. There’s a summer day camp for children where they can participate in games, crafts, and other learning projects. If you thrill to adventure on the water, then the Gauley River area of West Virginia is the place for you. Whitewater rafting trips for young and old alike are conducted daily by Ace Adventure Resort and there’s even a five-acre waterpark with slides, zip lines, inflatables, and white sandy beaches. Stand up paddle-boarding, kayaking, rock climbing, and bike rentals are also available. You’ll find plenty of options for family friendly activities that will build memories that last forever. It might not strike you that a mountain resort would have summer activities, but Snowshoe Mountain Resort in Snowshoe, West Virginia, isn’t your typical seasonal spot. Whether you’re looking for the adrenalin rush of mountain biking or rock climbing or something more relaxing like slowly canoeing around Shavers Lake, a round of golf with friends, or a quiet day at the spa, you’ll find it on the mountain. Who said a ski resort was only for the winter? Built in 1902, Camden Park in Huntington, West Virginia, has been thrilling visitors for over 100 years. This 26-acre amusement park has been a favorite for family fun, baseball games, local fairs, countless picnics, dances, and derbies, not to mention over 30 fantastic rides like The Rattler, the Big Dipper, Log Flume, and the Skyliner. And little visitors under 48 inches have their own Kiddie Land with smaller versions of the adult rides. The park offers special coupons and birthday packages, and there are a number of hotels and restaurants in the area for overnighters.